By default, you can edit only tasks that are assigned to you. You can add reminders only to a non-overdue task. You cannot edit a task status if the Task Flow workflow is enabled for your Oro application. On the task list, click the More Options menu at the end of the row with the necessary task and then click the View icon. Alternatively, you can click the required task and on the task view page. On the task view page, click the Edit button in the upper-right corner of the page. 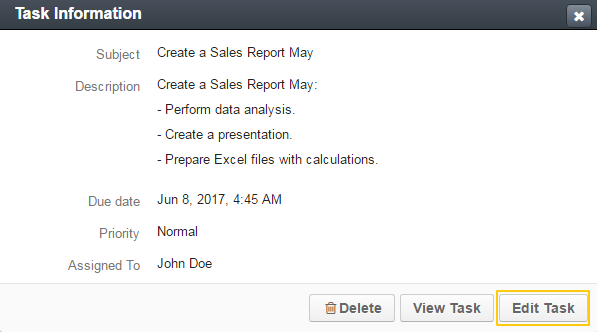 When user is assigned a task, it appears in the Tasks subsection of the Additional Information section in the user profile. Open the task assignee’s profile. Click Additional Information and navigate to the Tasks subsection. In the task list, click the More Options menu at the end of the row with the task you would like to edit and then click the Edit icon. 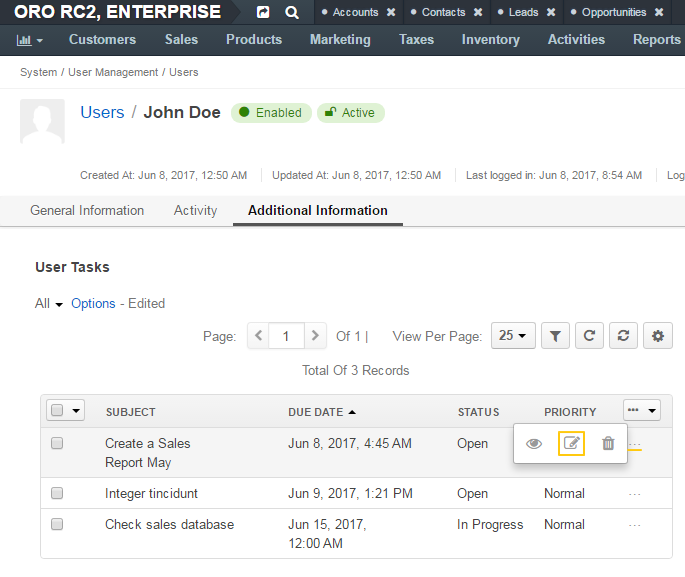 Entity records that are specified in the task context have this task displayed in the Activity sections of their view pages. On the entity record view page, click Activity. In the Activity section, click the More Options menu at the end of the row of the task that you want to edit and then click Update Task. In the dialog that appears, update the task details as required. For the description of the fields, see Detailed Task Information. You can tasks from the My Calendar page and the Today’s Calendar widget. Click the task in the calendar. On the Task Information card, click Edit. Update the task details as required. For the description of the fields, see Detailed Task Information.